The reason cruise ships stop at Katakolon is not to see Katakolon but to visit Olympia, site of the ancient Olympic games and that is what I did. Georgia opted out of the walking so, I was on my own. After meeting the rest of the tour group in the main lounge, we left the ship and met our guide Constantine. The tour started with a pleasant spring time drive through the port town and countryside around it. At Olympia, Constantine lead us on a walking tour of the grounds and then gave us time to wander around on our own. I was surprised at just how large the site is. There is much more here than just the Olympic stadium. There are the ruins of temples, sleeping quarters, baths, a gymnasium and much more to see. 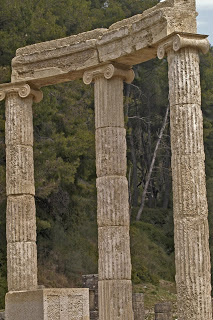 In fact, there are ruins on top of ruins dating from the 10th century BCE through the Roman period of the 3rd century CE. There are no roped or closed areas here (except a couple active archaeological digs). Visitors are free to walk through and touch these ancient works. After Olympia, we again boarded the bus which took us back to the port town of Katakolon for lunch at a restaurant near where the ship was docked. 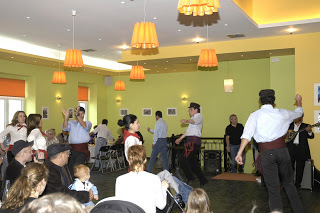 Our meal was accompanied by Greek folk music and followed with entertainment by a traditional dance group. We were back on the ship shortly before sailing and in plenty of time for dinner in the Posh dining room. More ruins to see at this stop. This was the Panoramic Athens tour and our guide for the day was named Angelica. 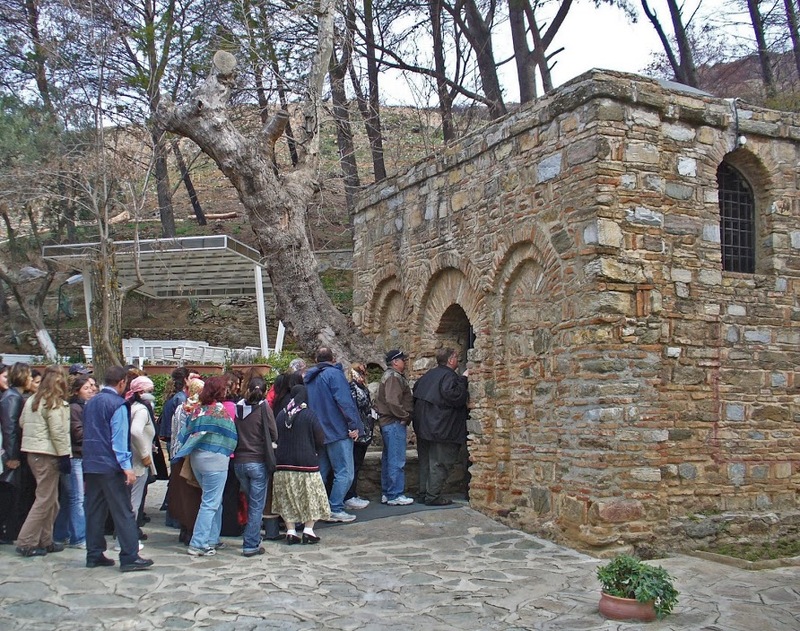 After a motor coach tour of the city, she would lead the group on a walking tour around Acropolis hill. 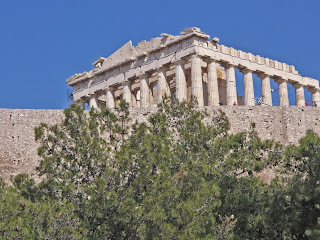 The tour of Athens doesn’t make any stops so all the views are through the bus window but, still impressive. The age of the city is hard to comprehend. We saw ancient ruins, thousands of years old and new constructions still being build. The walking tour of Acropolis hill is not only a chance to see the ruins there but also offers some spectacular views of the city laid out below the hill. This tour doesn’t actually go into most of the ruins but allows a good view from close by. The walk ends by passing down the ancient steps and into the Theater of Dionysos which was used by both the ancient Greeks and the Romans. If you ever take this tour, be warned that there is considerable walking over uneven ground. The theater at the end is especially steep and rough. Izmir is also known by it’s old name of Smyrna and is one of the oldest settlements of the Mediterranean basin. 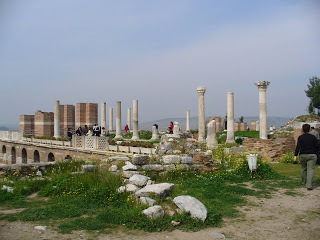 The main attraction here is that it is near the biblical city of Ephesus but, that is not what we had chosen to see. Instead, we opted for the more limited tour of the House of the Virgin Mary and St. John’s Basillica. Our guide Tunch did an excellent job of showing us these sites. 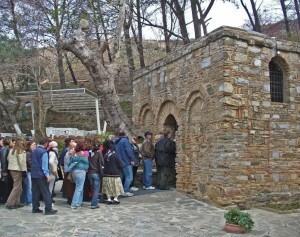 Mary’s house is a very small structure and the lines to get inside are long. No photography is allowed in the house itself but I got many of the outside and grounds. There are three drinking fountains near the house with water that is supposedly blessed. I didn’t stand it the lines line to drink the water so, I can’t say how effective it is. While Mary’s house is very small, St. John’s is a huge ruin of a church that was built in the 4th century with it’s dome over the supposed tomb of St. John the Apostle. Many areas of the basilica are still in amazingly good condition. There are even spots where you can still see the original mosaic tiles that once covered the floors. Turkey is now a Muslem country but one of the few that is not ruled by Islamic law. The drive to and from the tour sites go past many ancient mosques, baths and other structures that date from the time the sultans ruled the country. Turkey is very different than the other countries we visited on this cruise. It was a fascinating day ashore for sure. 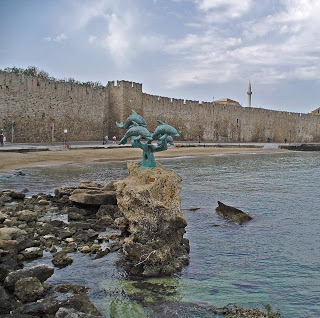 With no tour booked for today, I got off the ship and walked to the old walled town of Rhodes. The buildings inside the walls are now mostly shops but, you can also find some churches, fountains and other monuments scattered here and there. I only spent an hour or so looking around before I made my way back to the ship for an afternoon relaxing on board. The next day was a sea day. I will get to that and the last ports of the cruise in part 3.